Wicked is so good on so many levels, there really is no need to write a review – just go see it, if you can. The lyrics and music are achingly beautiful, the underlying messages touchingly resonant and topical, and the costumes and sets are simply fabulous. I love this show with every fiber of my being and, given the energy and excitement of the opening night crowd, it is a universal feeling among theater-goers. 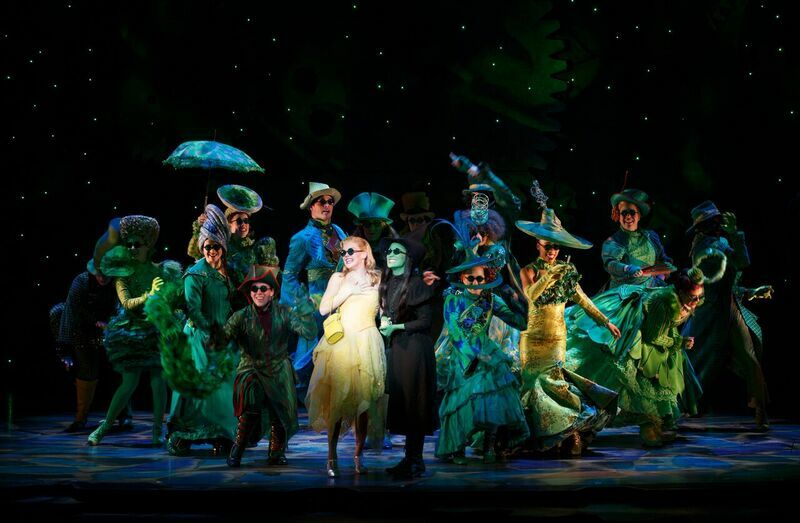 Wicked is playing at the Orpheum Theatre for a rare month-long run through May 14. The musical is based on the 1995 Gregory Maguire novel Wicked: The Life and Times of the Wicked Witch of the West, an alternative telling of the 1939 film “The Wizard of Oz” and L. Frank Baum’s classic 1900 story, The Wonderful Wizard of Oz. The musical is told from the perspective of the witches of the Land of Oz; its plot begins before and continues after Dorothy’s arrival in Oz from Kansas, and it includes several references to the 1939 film and Baum’s novel. Wicked tells the story of two unlikely friends, Elphaba (Jessica Vosk) and Galinda (Ginna Clair Mason), who struggle through a mutual “loathing,” rivalry over the same love interest, reactions to the Wizard’s corrupt government and, ultimately, Elphaba’s public fall from grace. This new telling turns the old story on its head about who is “good”, who is “wicked” and the cost of living an authentic life. Many in the audience also chuckled knowingly during the Wizard of Oz’s (Fred Applegate) speeches about authoritarian rule and the gullibility of the masses. The players in this production give the performances everything they’ve got. Vosk’s soaring vocals will raise goosebumps during certain songs, but I wanted more from “Defying Gravity.” Mason as Glinda has superior comedic chops even if her voice is a tad thin for the role. I particularly enjoyed Jeremy Woodard’s performance as Fiyero and Andy Mientus as Boq. If you’ve never seen the musical, DO NOT view Idina Menzel or Kristin Chenoweth in the roles beforehand – your expectations for the vocal performances will be raised too high. Watch them afterward and know what true Broadway magic sounds like. In the category of “don’t bite the hand that feeds you,” I am devoting the remainder of this review to a critique of the patron services nightmare that is the Orpheum. My 7-month pregnant companion and I were (threatened, cautioned) with not being able to return to our seats after the intermission if we did not leave the women’s restroom line that we had been waiting in for over 15 minutes, the length of the intermission. Let me assure you that we navigated the overcrowded concourse to go directly to the line. We returned to our seats five minutes after the second act began, displacing our non-bathroom-going and annoyed row-mates. It may very well be that the Trust is unable to execute any interior changes to improve the flow of patrons to and from seats to bathroom and other patron services because of historic preservation rules. I wasn’t able to find anything easily online to clear up that question. In these difficult times for the arts community, when public funding is under attack or being eliminated altogether, it may be irresponsible to call for major structural changes or big-ticket investments that improve patron comfort alone. I have taken a public tour of the space, love the building’s architecture and history, and appreciate the dedication of the staff. However, I know from conversations with theater-goers that many of them attend only a few events a year and may pay $150 or more (in the case of Wicked) for seats that are cramped and an intermission experience that borders on painful. I can only imagine what might happen during the expected sold-out future performances of Hamilton in the 2018-2019 season. The Hennepin Theatre Trust Board of Directors announced recently that Mark Nerenhausen began as new president and CEO of the Hennepin Theatre Trust. Nerenhausen previously served as president and CEO of the $354 million AT&T Performing Arts Center in Dallas. While there, he secured AT&T as a naming sponsor, raised more than $4 million in the first year of operations, created a governing board and instituted an integrated business information platform, according the a press release. Let’s hope he has similar success here in Minnesota and addresses these issues as soon as possible. From my research, the last major improvement (?) was the replacement of older seats in 2014. If structural changes aren’t permitted, I urge a thorough reexamination of the flow of available spaces to reduce congestion and improve the Orpheum theater experience. Wicked by Stephen Schwartz and Winnie Holzman, based on the novel by Gregory Maguire. Directed by Joe Mantello, musical staging by Wayne Cilento, costume design by Susan Hilferty, set design by Eugene Lee and orchestration by William David Brohn. Tickets start at $53, but a cursory check showed only the $100 plus tickets remain. For information on the public lottery, day-of-the-performance $25 tickets, go to https://hennepintheatretrust.org/wicked-lottery-for-25-seats/.